Roots in the Past – Seeds for the Future: The Heritage & History of Clover Valley, French River & Surrounding Communities was printed in Duluth, MN. The book was published in 2000 by the Clover Valley/French River Community History Committee and North Shore Elementary School. Twelve hundred copies were printed for roughly $9500. On May 19, 2000 a special event, “Our Celebration of Community Life,” was held at North Shore Elementary School to mark the publication of Roots in the Past. The program, with activities both in the school and on the school grounds, lasted from 4:00 p.m. until 10:00 p.m. and included music, displays, school tours, stories, food, and a dance. Attendees also had the opportunity to order advance copies of Roots at $10 a copy. Later, the book went on sale at shops along the shore, as well as local bookstores. Sales were brisk; there have been no copies available for more than eight years. Proceeds from the book’s sale covered printing costs and the surplus $8000 went to the elementary school’s (now North Shore Community School) endowment fund. David Smith, now retired but then a professor of Anthropology at the University of Minnesota – Duluth, is probably the person responsible for the impetus which led to the writing of what is known to some as the Roots book. In the early 1980’s David began working on a “Clover Valley Ethnohistory Project” and involved several UMD students, one of whom was Rich Sill, in preliminary research, much of which involved extensive interviews with long-time Clover Valley residents. Those interviews, many of which were done in 1987, were transcribed. David wrote a proposal asking for more funds to continue the research project but was unsuccessful. The transcripts were filed. In the 1990’s Clover Valley Elementary School teachers and administrators applied to the Center for School Change for curriculum development funds. Their intent was to introduce a foreign language curriculum at the school. A requirement for funding was a community component, and school personnel turned to Rich Sill for help. He mentioned that the interview transcripts existed. That material, with its community focus, convinced teachers and others already interested in such a project, to write a book, which would be the basis for units, appropriate for students at each grade level, focusing on community history. The “Clover Valley/French River Community History Project” began and went on for three years in the late 1990’s culminating in the publication of the Roots book. Jeannine Engelson, Helen Hendrickson, Bobbi Keener, Duane Madison, Robbie Tietge, and Rich Sill were “history committee” members. They met monthly, doing more research, gathering more oral histories, and photographs. They asked Carl Gawboy to write about early peoples as well as the Anishaabe (chapters one and two of Roots). He also contributed illustrations. Arna Rennen donated her painting of the French River store for the book’s cover. Julie Igo edited text, and laid it out with photos on electronic media. In his preface to Roots David Smith begins: “I’m convinced by the experiences I have had over the years that there exists a fundamental human need for community.” He goes on to speak of “communitas,” a deeper sense of community that, while it includes our social and religious institutions, transcends those and might be considered spiritual. And this larger meaning is predicated upon a sense of place which includes not only relations with others in the area but of our being part of the natural community in which the human community is embedded. Another way to say this is that we are of the land. Helen Hendrickson, considered by many to be a community elder, learned from early personal experience that the adults in her life had to be concerned about one another; they depended upon one another for support and, to some extent, survival. “Economically,” she says, “we could not stand alone. We knew each other.” Knowing included health, economic standing, nuclear family relationships as well as relationship with relatives here and in the old country. She was convinced students and adults needed to know about the community they lived in, its pioneers, their lifestyles, struggles, and dreams. By collecting and publishing stories of earlier community members, the present generation would have a better understanding of its roots, and, since we are shaped by the area in which we live, the place we live in, of ourselves. Thus Roots in the Past – Seeds for the Future was born, initially intended as a source text and guide for North Shore Elementary curriculum units Then it became something much larger, the story of the community. Our story can help us understand who we were/are and build on that understanding as we make choices as individuals that shape this evolving community. Thank you to Helen Hendrickson, Bobbi Keener, Duane Madison, Robbie Tietge, Rich Sill, Arna Rennen, Carl Gawboy, Julie Igo, David Smith, and Jeannine Engelson’s son, Bob Engleson, for agreeing to make this digital copy available to the public. 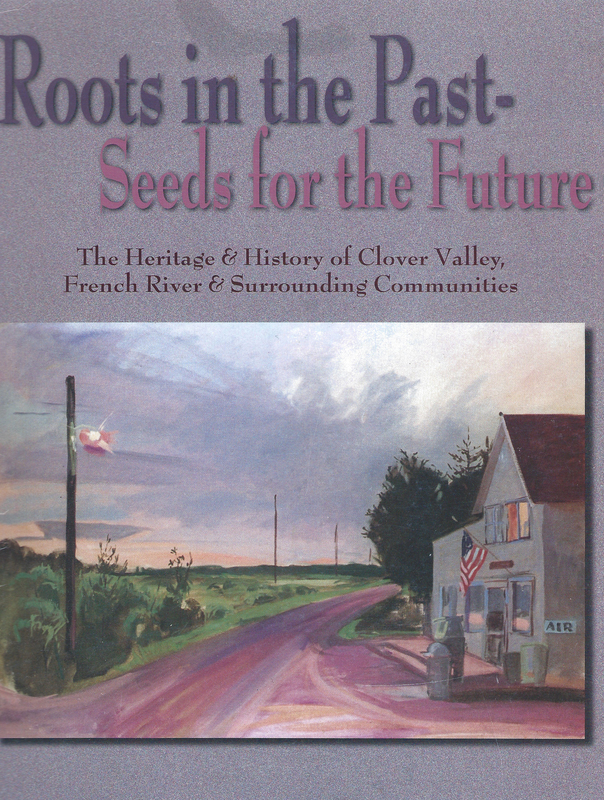 Click here to read Roots in the Past – Seeds for the Future: The Heritage & History of Clover Valley, French River & Surrounding Communities.